The Day of the Dead is a way to welcome all those that have passed before us. Solemn ceremonies, candlelit parades, and altars mark the day's special nature. But just like people themselves, everyone who has passed is different. It's a little twisted to assume that everyone wants an Ava Maire instead of their life-long favorite rock band played beside their grave. And no every spirit wants to look at their own picture while their family prays. Some spirits would surely dance with their people one more time instead! See, just because you pass on doesn't meen you've got to tow the line. Even skeletons can have their own tastes! Color reigns supreme with this lovely layered costume. The strapless top has a ribcage and spine printed on top while a heart beams from inside the body. Three-dimensional roses dot the neckline, matching the choker and the crown of flowers that trims the veil. You'll have plenty of fun dancing all night in the brightly tiered skirt with black lace trim along each hem. 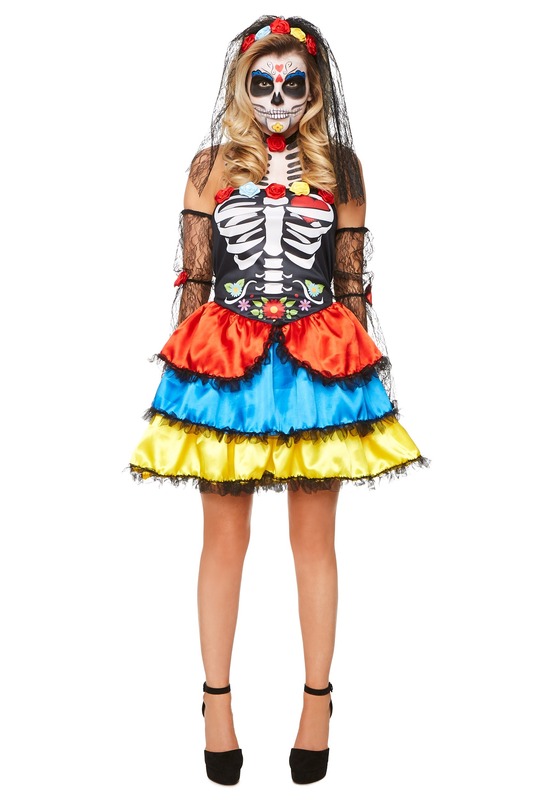 With a balance of macabre and color, all you'll need is a top-notch sugar skull face and you'll be ready to celebrate! Any spirit who's anyone wants to hang out with a ghost as lively as you are! You'll always have a wonderful time when juggling spooky and scary. You can accessorize this look however you see fit. We have lovely flowered looks such as makeup kits, flower masks, and even charming skull tights. Whether you are headed to a Day of the Dead event or setting off for a Halloween party, this costume is sure to be a hit with all the ghouls and gals. Just remember to keep it light, just because you've been sleeping in a grave all year doesn't mean the party has to be dead.